Height: from 300 to 663 meters above sea level. The most inaccessible city in the world ancient Pitigliano can be called bold, located in the beautiful Tuscany. This ancient city was literally built on the cliffs, stone structures and protective walls are integral with the steep cliffs. According to historical records, hundreds of years ago were engaged in settlement basis Etruscans. They specifically chose the site of a high hill, which is surrounded on three sides by impregnable cliffs to best protect themselves from invaders. Ancient buildings, which can be seen today, located at an altitude of 300 to 663 meters above sea level, many buildings and fastening walls could perfectly preserved to our days. The amazing Pitigliano for many hundreds of years, lives his life and is considered one of the most beautiful places in Tuscany. Travelers who are not afraid to go a long way and climb the highest hill, have an opportunity to stroll through the enchanting medieval streets and see a lot of unique attractions. 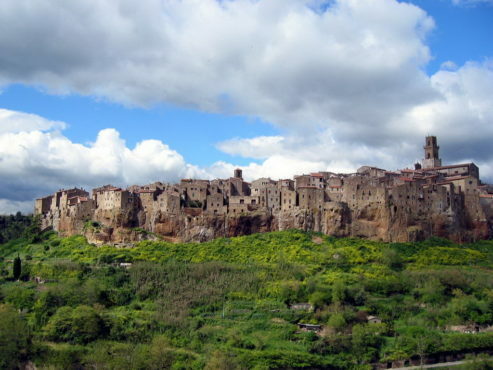 Pitigliano is often called «Little Jerusalem», a significant part of its current population is Jewish. One of the main symbols of the city is the historic Orsini Palace, which was built in the 16th century and is now the archaeological museum location. Largely thanks to the unique location of the city managed to keep its unique medieval appearance, on the territory of Pitigliano completely absent modern buildings. Walking through the old town will be a real journey into the past.